Reading Teachers = Reading Pupils (RT=RP) is a network of teachers’ reading groups. It responds to the need to increase children’s reading for pleasure, which has been revealed as the most important indicator of the future success of the child. It does this strategically by investing in teachers, who are for many children their most significant reading role-model. 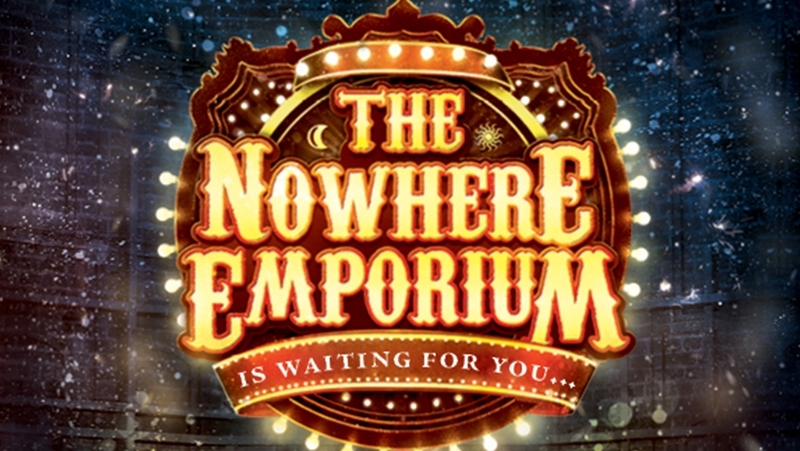 We asked Upton St Leonards C of E Primary School teacher Kat Wood to explain how The Nowhere Emporium by Ross MacKenzie is inspiring the children in her class. 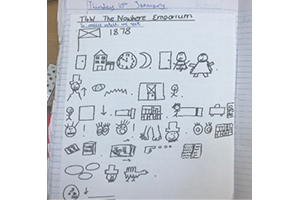 We have embraced a Talk 4 Writing approach to planning our literacy for the last 18 months and I was really keen to see how I could plan a T4W unit using ‘The Nowhere Emporium’ by Ross Mackenzie. I fell in love with the book at the launch after hearing Ross speak so passionately about it; the cover of the book was like nothing I had seen before! I began by reading the book as a class read in the autumn term and was delighted to see the children buy their own copies to read alongside. On their return from Christmas, I created ‘The Nowhere Emporium’ in my classroom! Charity shops and eBay proved to be treasure troves and I was able to get mirrors, magpies, offcuts of velvet and gems really cheaply. 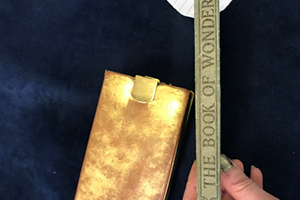 My greatest find was an antique book called the book of wonders!! It cost £2 and I filled it with torn out pages of wonders. To finish the immersion I used joss sticks (risk assessed of course) to create some of the smells within the emporium that Ross describes so beautifully. The children’s imagination was sparked and thus began our T4W unit. I feel that in order for T4W to be most successful, the model text needs to be short enough to learn fluently. I decided that I wanted the final written outcome to be a flashback scene, so I adapted the flashback scene from the novel where Sharpe meets a young Lucien Silver at the children’s home. 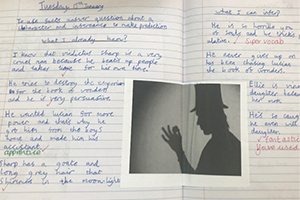 By writing my own text I was able to include the grammatical features and sentence structure I wanted to underpin their writing whilst making the extract short enough so that the children would really know it. We story mapped and learnt the actions for the extract and I loved seeing the children invent actions for Lucien Silver and Vindictus Sharpe. This led to lots of drama opportunities and I borrowed costumes to enable the children to become magicians within the emporium. This stage of T4W is so important as they need to see the text as readers not just writers. 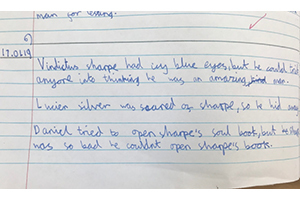 It was at that stage I wanted the children to really explore the character of Vindictus Sharpe and so we delved deeper by completing a ‘what do I already know and what can I infer?’ activity. This allowed the children to justify their thinking. For example, it’s not enough to just say that Sharpe is a villain; what makes him a villain? Is he all bad? Are there layers to his flawed character? We had some fantastic debates. We shared some of our writing with Ross on Twitter and it was fantastic for the children to see a real-life author like their writing. Alongside these activities I was able to include sentence and grammatical activities. Short burst writing and building a toolkit to provide them with everything they need to write the final outcome. I wanted the children to explore BOYS sentences in their own writing (but, or, so and yet complex sentences) we created a bank of BOYS sentences relating to each main character within the novel and displayed them on our washing line. 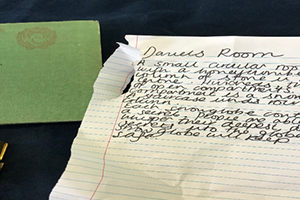 The children then boxed up the extract and innovated their own flashback story from ‘The Nowhere Emporium’ using their writer’s toolkit. The children are so excited about sharing their work with Ross at the Reading teachers=Reading pupils sharing day. This has given their writing a real-life purpose. As a not-for-profit organisation and registered charity we depend on donations to bring the arts and sciences live to audiences, support emerging talent, and deliver inspirational educational programmes.